This Condo has been completely renovated with all the luxuries of home. It is located on the first floor with the added convenience of no stairs or elevators to hassle with. The condo features 2 bedrooms and 2 bathrooms. The Master Suite is a place to retreat with King size bed, remodeled private bath and vanity area. The 2nd bedroom has 2 full size beds. 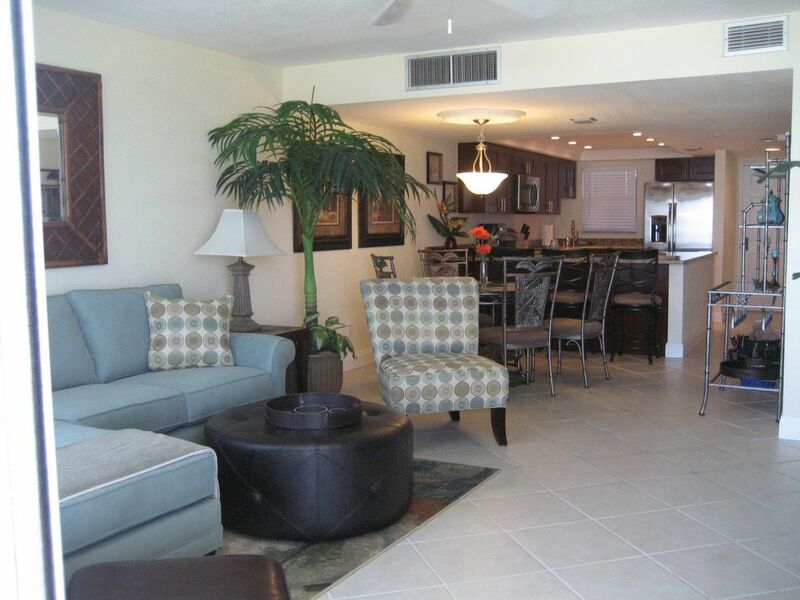 Enjoy the open living area, which has direct access to private balcony/patio. Living room is spacious with brand new furnishings. The dining area seats 4 with an adjacent breakfast bar for additional seating. The kitchen is fully equipped with brand new appliances, new cabinets, granite counter top and everything needed to prepare a home cooked meal. This Unit has it All and then some! It is just 70 minutes from Orlando's main attractions and after a long day the perfect place to relax and call your home. Complementary Wi-Fi in the unit. Private Full size Washer and dryer. Full size kitchen with all the luxuries of home. WiFi, Air Conditioning, Cable TV, Stereo, Full Kitchen, Microwave, Dishwasher, Refrigerator, Cooking Utensils, Linens and Towels provided, Washer, Dryer, Sauna, Pool (shared), On-site tennis court, basket ball court, shuffle board, fitness center and game room. CALL FOR LAST MINUTE RENTAL SPECIALS. We really enjoyed our stay in unit 103 it was beautiful and clean would love to come back again some day.Our thanks to the owner for excellent service. Our stay at this beachfront condo was as good as the owners promised it would be. Their condo description was accurate and location was perfect for us. We were on the beach, close to a bridge to the mainland and near enough to all the attractions. The property we stayed at had just been remodeled with all new furnishings and appliances plus new flat screen TV's. The pool was literally a few steps from our patio door and the beach a few more steps beyond the pool. We were on the first floor, something I had been skeptical about, but the view of the ocean was unrestricted and the conveniences of being on the ground floor were very nice. I have already recommended this unit to a family member and plan on a return trip soon. Sue and Rick were very happy to have us and treated us very well. The condo property was quiet, well run and spotless. Plenty of covered parking and lots of conveniences - even a water hose to wash off your car. Beautiful unit, great location and nice people to work with. Dan, We appreciate your time to share your experience on our newest condo. We aim to please and it looks like we were met our goal. We used the condo ourselves after renovation as our get away and now we are happy to share our home. Add 12.5% sales tax, $85 cleaning fee and a $300 security deposit. These rates do NOT include special events and holidays! Please inquire for special events/holiday and monthly rates. Ask about our last minute specials! We have other 2 and 3 bedroom condo units as well!